This morning we were privileged to support a recognition service for Constable Kate Campbell the first policewoman for Tasmania Police in 1917. Kate was from Launceston but settled in Victoria after she left Tasmania Police. The ceremony was conducted at St Arnaud cemetery. Tasmania Commissioner of Police Darren Hine and Acting Chief Commissioner Victoria Police Shane Patton were both in attendance. In 2017, both states are celebrating 100 years of women in policing. Edition 17 Constable T Bear is now released. We are proud to dedicate the 17th Edition of Constable T. Bear to all of the Chief Commissioners who have served the people of Victoria. Only 5,000 bears have been commissioned for this limited edition release. 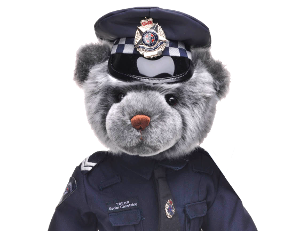 You can order Edition 17 Constable T. Bear online here.